"We just saw a big ship, so we stopped it," said Sugule Ali, the spokesman for a band of pirates that on Sept. 25 hijacked the MV Faina, a Ukrainian freighter packed with Soviet-made tanks, grenade launchers, ammunition and other high-grade weaponry. The seizure was perhaps the most brazen in a recent spate of attacks on vessels crossing the world's most treacherous waters. According to the International Maritime Bureau, pirates have carried off 63 attacks and 26 hijackings off the coast of Somalia so far this year, seizing 534 crew members; 12 ships and 259 sailors (including 20 aboard the Faina) remain captive. "Think of us like a coast guard," Ali told the New York Times by satellite phone. Today's pirates pursue their prey with outboard motors instead of oars and tote rocket-propelled grenades instead of cutlasses. 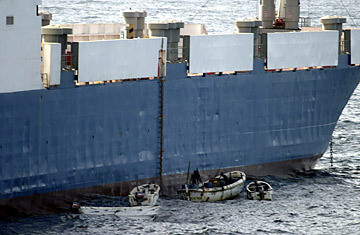 With upgraded equipment and loftier stakes  the group demanded $20 million in ransom for the Faina's return, a figure that reportedly plunged to $5 million on Oct. 1  these 21st century buccaneers, like their peg-legged predecessors, are economic opportunists exploiting the largely unpatrolled waterways through which 90% of global trade flows. Pirates have plagued seafarers for millennia. Homer and Cicero noted incidents involving ancient Greek and Roman mariners, and Western Europeans weathered Viking onslaughts during the Middle Ages. In the 16th and 17th centuries, monarchs frustrated by Spain's dominance of the Caribbean commissioned privateers to harass the Spanish fleethelping to usher in piracy's golden age, when swashbuckling marauders like Edward (Blackbeard) Teach roamed the sun-splashed islands, plundering gold and silver. Piracy declined in subsequent centuries, thanks to increasingly vigilant militaries and the development of the steam engine. But amid a drop in naval patrols and a boom in international trade following the end of the Cold War, it has flourished anew  particularly in narrow choke points such as Asia's Strait of Malacca and the Gulf of Aden, which links the Red and Arabian seas. Buoyed by fast boats, fearsome weaponry and high-tech communications gear, pirates carried off 263 reported heists in 2007  28% of which occurred in the treacherous waters off Nigeria and Somalia, where vast coastlines and feckless transitional governments make for easy marks for plundering pirates. Despite a June U.N. resolution that lets naval allies surveil those waters, ships are warned to stay 250 nautical miles from land. That legislation has spelled trouble for Ali and his cohorts. Fueled by fears that the cache of weapons could make its way to al-Qaeda-linked insurgents, the U.S. sent warships to encircle the anchored vessel as an international fleet hurried to join them. In his interview with the Times, Ali seemed cheerfully fatalistic about the prospect of tangling with the world's naval superpowers: "We know you only die once." Rumors flew that three pirates had already perished during a shootout stemming from a disagreement over whether to surrender, but the pirate spokesman dismissed the claim. He said the marauders onboard would withstand the siege, and didn't seem in much of a hurry to defuse tensions. In the meantime, he said, they would take meals alongside their hostages and celebrate the Muslim festival of Eid, which marks the end of Ramadan.